If you were judging from the opening keynote at VMworld 2016 in Las Vegas, you’d get the impression that the emerging container ecosystem hadn’t fazed VMware in the slightest. Instead, VMware seems intent on following customers as they extend their infrastructure further into the public cloud. The company announced what it calls VMware Cloud Foundation, and although it’s mainly vSphere, Virtual SAN, and the NSX network virtualization component wrapped up in a nice, new package, the platform certainly looks more like OpenStack than it did last week. But it was part of a very cleverly planned agenda for this year’s show. Not featuring container technologies on the big stage gave VMware’s executives the full opportunity to portray its existing virtual machine platform as an almost unchallenged leader in staging workloads. Only outside the keynote stage was the existence of a container ecosystem discussed at any length. The theme of that discussion: Adopting containerization should not make a data center change the architecture of its infrastructure. Cloud Foundation is being geared as a management platform for every class of application workload, including virtual machines and Docker-style containers, with or without vSphere integration. This management capability can be extended to public clouds, when workloads are migrated there. Policies follow workloads to the public cloud, so the same network restrictions apply when a VM is run in Azure as on vSphere in the customer’s private cloud. 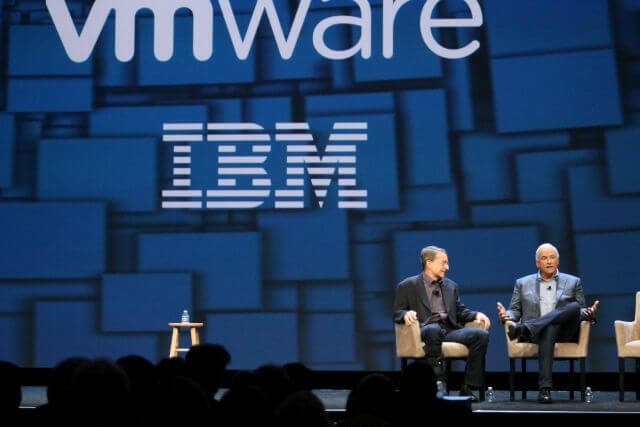 During the keynote, CEO Pat Gelsinger announced an extension of VMware’s strategic partnership with IBM, giving its public cloud platform equal footing with Amazon AWS, Microsoft Azure, Google Cloud, and VMware’s own vCloud Air in Cloud Foundation’s list of support options. Ironically, this also put IBM in the position of finding a place for VMware amid the many technologies its cloud platform(s) supports – a list which, of course, includes OpenStack. LeBlanc went on to explain how its Bluemix PaaS platform lets developers target their apps to VMware, OpenStack, and Cloud Foundry, among other hosts, as part of IBM’s mission to respect customers’ choices. 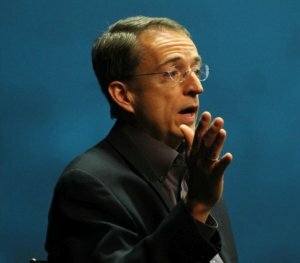 VMware’s new strategy with Cloud Foundation borrows some of IBM’s brand reputation to give customers incentive to extend their NSX virtualized network footprint outside their own premises, into the public cloud. The basic definition of NSX is being altered a bit. Rather than the network virtualization counterpart of a hypervisor, like ESXi, the new NSX in Cloud Foundation is being positioned as a service – literally, a management portal for defining the virtual network infrastructure for a workload, including container-based, wherever it may exist. Appenzeller went on to explain that containers typically rely upon the kernel to provide them with the necessary separation that gives them their basic security. “The attack surface of the kernel is much, much higher than the attack surface of a hypervisor,” he said. An attack strategy for a hypervisor would require passing parameters through a homemade driver since a hypervisor is not open to outside functions, he said. But a Linux kernel may have thousands of addressable functions, driving up its potential for exploitability. 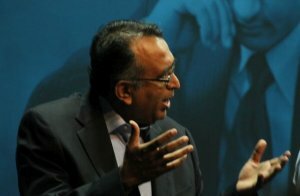 Surprisingly, VMware’s Raghuram made the case Monday that this alternation to the conventional definition may be necessary to minimize the impact of evolutionary changes to the underlying platform, on VMware’s existing customer base ­­– specifically, upon the company’s core users. “One of the reasons we took the course that we did is, we looked at our existing customers and what tools they use,” the EVP said. “Existing customers — operators of IT — need to be able to go on this evolutionary journey without a radically different experience… You’ll see, once we get into the nitty-gritty of how they will actually do it, how they will operate it, the tools are very familiar to our existing markets. Yes, there may be the need for changes in the organizational models of companies — in the responsibilities that individuals are granted and the skill sets they’ll be called upon to use, he went on, evidently in deference to the needs of DevOps. However, those changes should not impact the way VMware tools are interpreted and put to use by these same people. That would explain the company’s strategy for putting NSX to use in the public cloud. It wants to avoid changes to the operating model so as to avoid disillusioning IT operators. If that means blurring the existing distinctions between firewalls and the outside world, or what constitutes a service when it’s being deployed into a multiple cloud environment, then so be it. Definitions are fragile things; terminology is temporary. Skill is a resource worth preserving. Tuesday, the company is expected to announce its formal introduction of the final, commercial version of vSphere Integrated Containers. These are not containers in the Docker tradition, but rather a way of taking standard containers and wrapping them in a special coating that makes them digestible to vSphere, which treats them as virtual machines. What we expect to learn Tuesday is the extent to which VMware is willing to make its integrated containers the preferred option for containerization. Put another way, will enterprise customers be required to adopt this kind of hybrid container if they intend to use other key features of Cloud Foundation? More on this question, and much more from VMware’s Guido Appenzeller, as The New Stack’s coverage of VMworld 2016 continues this week from Las Vegas.